We are a container rental service company in Winston Salem region that puts premium on affordability and superior quality service. Do you need to clean the heaps of rubble and debris on your front yard as a result of a recent remodeling or construction? Are you finally ready to clean out your closet, or tear down your faded wallpaper? We can send over the containers at the quickest possible time, even at very short notice. Do you have mountain of debris or rubbish following a clean-up or construction project? It’s an ugly sight indeed, and you can be a target of complaints from neighbors and the homeowners association. Talk to any one of our customer representatives at Jux2 Dumpster Rental so they can answer all your questions regarding the rental costs, the right size for their particular requirements, and even the required documents to be filed with the government or homeowners association. Homeowner and commercial businesses are concerned about the rent prices, the sizes of the dumpsters and the licensing requirements. We are confident they can answer all your questions and quell all your doubts. A 10- to 15-cubic yard dumpster is just enough to take away rubbish from a small-scale remodeling project. They have the same width at seven feet, six inches. This is just the right size to accommodate all the junk in your kitchen, bathroom, or storage space. If you are remodeling your kitchen or bathroom, the small containers would be enough to hold the resulting debris. The 20 cubic yard dumpster can store up to 6 pickup truckloads of trash from a kitchen remodeling project. If you are renovating multiple rooms, too, a dumpster of this size should be big enough for all the junk you are finally ready to let go of. It’s also a little under five-feet deep so there’s a lot of space in there to put the rubble. 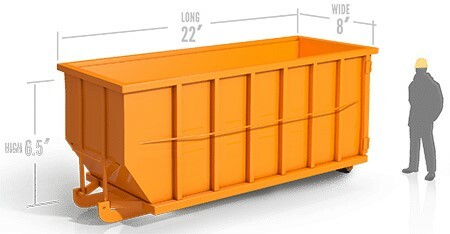 The 30-cubic or the 40-cubic yard container rentals are recommended for huge cleanup projects. They are both 22 feet long and nearly eight feet wide. Call our representatives today at 336-823-6800 for quick consultation. We have experts on the line to attend to your queries about how you can rent a dumpster without having to pay so much. In some cases, you pay for the right to throw in the landfill. Don’t’ worry, we at Jux2 Dumpster Rental can help you find a very affordable package in Winston Salem. Basically, the rental cost will vary depending on several factors. Again, pricing is pretty standard especially for companies like us with all the requisite permits and documents obtained from the city. You also have to consider the landfill fees, if there’s any. We can help you determine the type of dumpster to fit your needs and budget. Make up your mind of things you want to let go of before you rent a dumpster. It must be noted, however, that the price of dumpster you rent will be based on the type you choose. If you expect a heavy load, you must expect to pay a higher price for a bigger dumpster. Again, we will do all the heavy lifting for you. We always welcome the opportunity to tell you more about our available containers and the cost of a dumpster. But first, let us know about what you intend to do, how big your project is, what types of materials must go in the container, and where your location is, then we can calculate the cost of the dumpster and then advise you accordingly. Now, you know what container will work according to your budget and needs. We can’t park the dumpster in the sidewalk or street without the permission from your local homeowners association or the local city office. This way, you can be allowed to have the dumpster outside, although, you still need to make sure it does not trouble pedestrians, too. This will allow you to place the dumpster on public property without fear of getting arrested or anything, so long as you make sure that the container does not get in anybody’s way. We, at Jux2 Dumpster Rental, have your best interest in mind, so take our advice and call your local authorities for the requirements you need to accomplish for any project that requires waste removal. That office should be able to update you of the latest measures that you need to undertake, especially when you want to rent a roll off container that is larger than your lawn can accommodate. Moreover, do not underestimate the need to coordinate with your local officials if you are going to rent a roll-off container on days when there is street cleaning. Your local homeowners’ association may also have its own rules on the matter, which we don’t know about. For more inquiries and clarification, call our container rental service at 336-823-6800. Rest assured that we will provide a solution to your problem.